This has been one fun week! If you recall, our four boys were in charge of planning and cooking meals one day each this week. Here is their menu plan if you’d like a reminder. 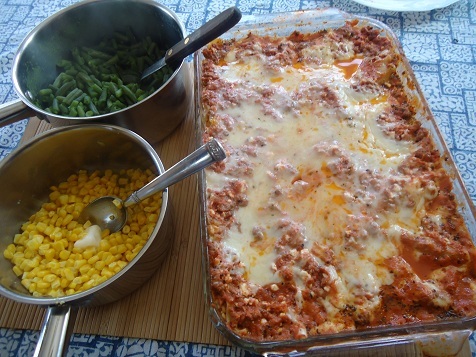 We’ll begin with Monday’s meals – the day Asa, our 15 year old, did all the cooking. He actually didn’t make breakfast that day (logistical issues), and is instead making breakfast on Saturday before soccer games. 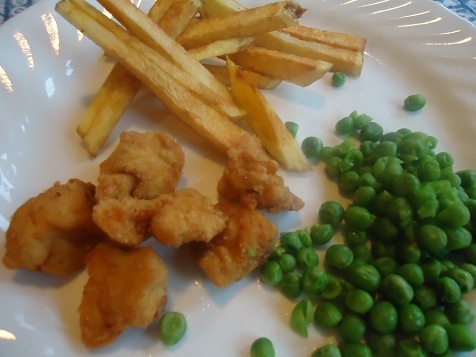 For lunch, he worked and worked, cutting chicken and potatoes into nuggets and fries. He then used our fryer (the one Matt and the boys gave me for Christmas!) and cycled through batch after batch of fries and chicken nuggets. I was impressed with how he never stopped working until the last batch was finished. In fact, at one point, I stepped in to help and he said, “Wait. I thought I supposed to be cooking this meal?” Sweet! I promptly put down the knife and went over to eat fresh french fries. 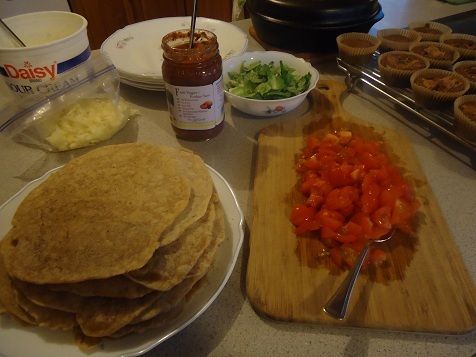 For dinner that night, Asa and I worked together to make a double batch of fresh whole wheat tortillas for tacos. That was quite a job, and he did awesome once again! He also took the time to make Peanut Butter Brownie Cups. We devoured that meal. SO good! Tuesday was Elias’ day – our 11 year old. He got right out of bed and made a big mountain of French Toast. Just like his brother, he didn’t stop to eat until all of the bread and eggs had been made into French Toast. That’s saying a lot for a kid who is typically ready to eat his pillow as soon as he wakes up. This boy wakes up hungry and is a HUGE breakfast eater! 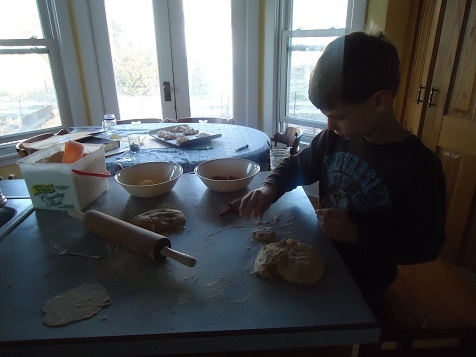 After breakfast, we cleaned up, then I taught Elias how to make pie crust. More on that later. :) For lunch, Elias used the Corndog Maker he got for Christmas to make 40 corndogs. (They actually were 20 hotdogs cut in half.) There was a grand total of three corndogs left after our meal. 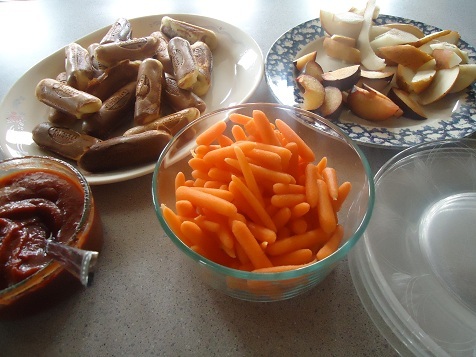 We sliced up pears and got out baby carrots to go with the corndogs. Oh, and we decided that our corndogs would be stickless. No need to go to the trouble to put a stick in the dog when we’re just going to devour it anyway, right?! 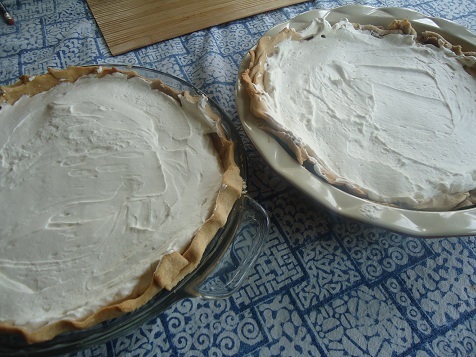 Right after lunch, Elias got busy making two Cream Cheese Lime Pies. Into the fridge they went. Then, he browned hamburger meat and put his dinner into the crock pot. 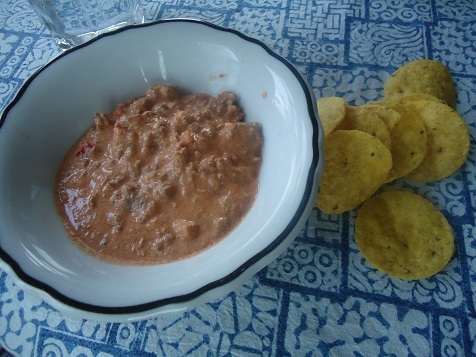 When it was dinnertime, all Elias had to do was get out bowls and chips to go with his Hamburger Cream Cheese Dip. I think we had apples with this, but for the life of me, I can’t remember. And yes, we did just put our chips on the table beside our bowls. Who needs extra dishes? After dinner, Matt had a few buddies over to play cards. 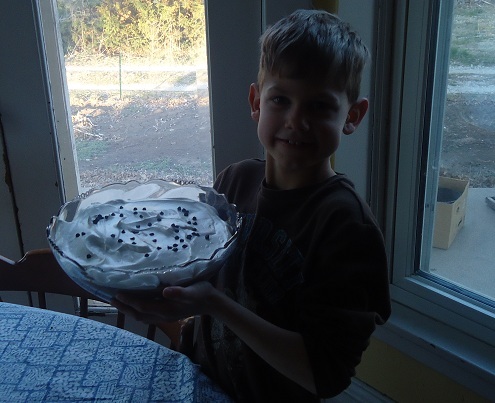 Elias served us all some of his pie. It was crazy good!! 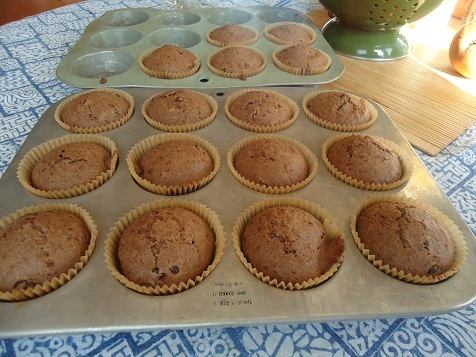 That night, Justus, age 13, who was up next for cooking meals, got into the kitchen and made Chocolate Chocolate Chip Muffins to serve for breakfast Wednesday. That got our morning off to a great start! Justus made us a huge lunch that day!! 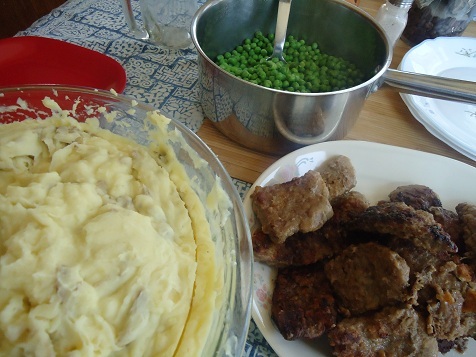 Chicken fried steak strips, mashed potatoes and gravy, peas – wow. I can’t believe how hard that kid worked. Would you believe I forgot to take pictures of his dinner? :( He made pasta with Alfredo Sauce and steamed broccoli and carrots. It was delicious, but we rushed off to church after we ate and taking a picture completely slipped my mind. 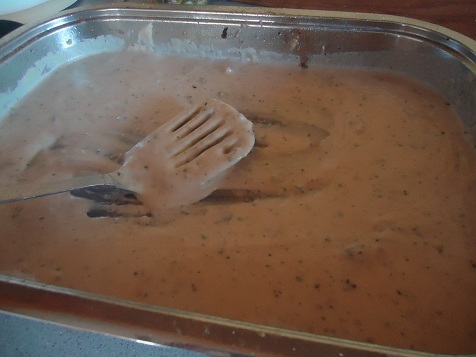 We ate the lasagna for lunch, since there were soccer games in the evening. It was delicious! After lunch, Malachi made brownies because he was set on making Death by Chocolate for dessert. 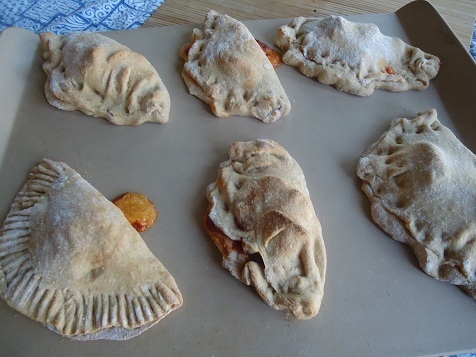 In the late afternoon, he and I made a double batch of Calzones so that we could have some in the freezer as well as plenty for dinner. Sheesh, did we eat a lot of sugar this week!!! Big desserts every day of the week? Too much. But shucks, it was fun just this once. What was I doing while my boys were cooking up a storm this week? Standing in the kitchen helping them cook, cleaning up messes with them, and offering a lot of guidance. I found that everything took at least twice if not three times as long as it normally takes me. But wow, did the boys learn a lot! What a really awesome thing to do with your boys! They will surely grow up to be blessings to their wives, and I’ll bet they will never forget the time you took to teach them to cook. You inspire me! 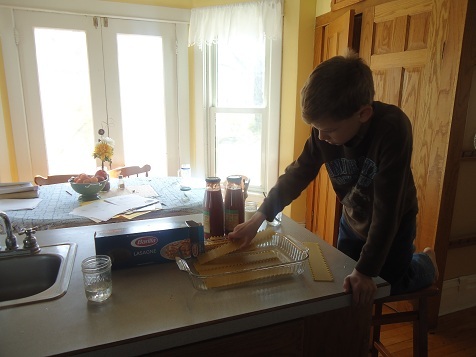 I’m so impressed with this plan to teach your boys and let them take charge in the kitchen. You better believe their wives will be grateful! What a good mama, you are so patient! I just kept thinking as I read, wow! Her boys are cooking and the kitchen is cleaner than when I do! I would have egg drizzled all ove that stove! What a great lesson for your boys. We tried that for a month, hmmm, time to start again. Everything looks so amazing!!!!! Great job boys, your mama sure is proud!!!! Love it. When my kids are older I will definitely be trying this. How awesome is that?! I think it is so cool you did that for your kids. It’s funny how the time it takes to prepare a meal when kids are helping makes it take soooooo much longer. Being 7 months pregnant, I just tell them I am nearly done when they ask. I can hardly stay on my feet the time it take for me to cook. I have five kids right now, four of them girls. My youngest two come in when I make bread. The baby (2) likes to pinch off and eat pieces. My 4 year old is always asking to try what I am chopping at the cutting board. I was thinking you had a lot of sugar because I think I remember you saying you don’t eat dessert every day of the week. My kids would have been all over it. I am always trying new recipes from your cookbook. The other day it was the taco biscuits and the family loved them! What a wonderful idea! I will definitely be doing this with my 5 kids!! I do have a question. How do you like the corn dog maker and fryer? I love corn dogs but messy to make and feel deep fryers are hard to clean and more a hassle then heating oil on the stove;) do you use palm oil in deep fryer and does it take a lot? We love both the corn dog maker and the fryer! The corn dog maker wipes up easily. And the fryer – I don’t feel the need to change the oil or clean it often. I just wipe down the outside of the fryer once it cools down. I use either expeller pressed coconut oil or palm shortening in the fryer. It does take a lot, but I reuse it many times, so I feel like I’m likely saving money in the long run. It makes the frying process go SO much faster! Great idea! 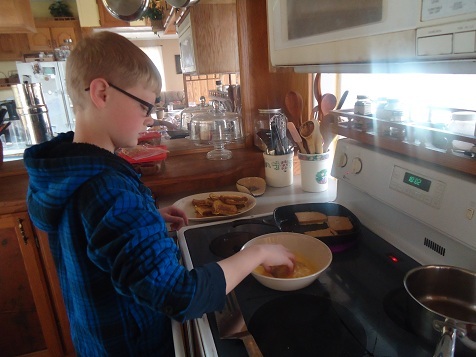 I will begin homeschooling next year and have already planned to add a cooking class for my two boys. Do you have the recipe for the cream cheese lime pie somewhere? That sounds delicious. I don’t have, but I’m hoping to share it eventually. It was an experiment, and it turned out awesome! Congratulations Kendra, on your home schooling choice. I hope that you have a special person you can go to for those days that will not be great. You will need that moral support. Congrats on a fun and tiring week. I smiled at your comment about how long it took to get meals out with the boys doing it. Reminds me of a comment my Mom would make when the 5 of us siblings were small. “Just think, what use to take me a W H O L E half hour, now only takes 45 minutes!” We were always so proud to be of such help to Mom. (At least until we could tell time and knew what she was saying!) Blessings on the rest of your week. What a good momma to spend all that extra time in the kitchen teaching your boys! They are going to make some awesome husbands someday (can I put dibs in for Malachi for my daughter ;) I’d love to get my kids cooking up a storm when they’re older. p.s. You guys ate like kings! How wonderful! I can’t wait till my kids can be that involved in the kitchen! What a fantastic idea! 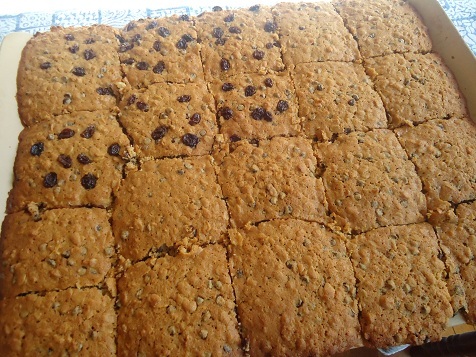 I got to help my mom bake a few times when I was young, and was chief salad-maker by the time I was 8 or 9 (the main veg/side we ate when I was a child)… but I never really made a full meal until I was about Asa’s age. And making home-made nuggets or fries would have been way beyond me! How great to see what all your kids can do in the kitchen. I realize that I’m not letting mine help near enough. Thanks for sharing and inspiring us all. You should be commended for how you are raising your sons. I am sure if they get married their wives will be grateful you took the time to teach them to cook as well. I have learned it does take more time when your kids help in the kitchen but that is the only way they learn. My mom didn’t let me help until I was older so I am letting my kids help when they are interested at an early age. God bless you and your husband in how you are raising your sons to be a blessing to others. You brought back all kinds of good memories of helping out with meals when I was a kid. My parents let us experiment, too, so there were plenty of times when meals were less than stellar. But we learned. All six of us are now excellent cooks, healthy eaters, and very adventurous in the kitchen. And as others have said, good for you for teaching your boys cooking. Best thing my parents did was to have no distinction between “boy chores” and “girl chores”. My brothers cooked and scrubbed toilets like housemaids and we girls could mow the lawn and change the trash as good as any guy. And your daughters-in-law will rise up to call you blessed . . .
Really neat post. I love these ideas. I spend a lot of time in my kitchen. My girls love to be involved in everything (especially tasting). Thanks for reminding me that this is part of their training and I need to step aside to let them do more. You did a fantastic job. Justus, what a neat cake you did. 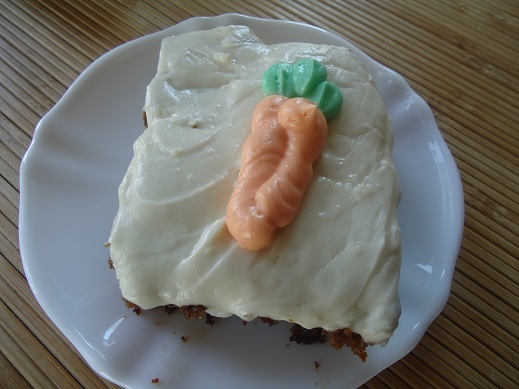 I wanted to eat it NOW! Congratulations on bringing such a blessing to your mom. She is a special lady. You are four really cool guys. Awesome idea! Will you please share the recipes that you didn’t link? Yummmm! That’s awesome. When my kids are tall enough to reach the countertop……! So cute! I’m glad they had fun, and got to see it takes a lot of work to prepare meals!! fear of yucky stuff in it? Suggestions? I’m guessing Daisy does use antiboitics, unfortunately. The reason I have been purchasing it recently is because the only ingredient is “cultured cream” instead of one with lots of fillers. I use Daisy for the same reason. Not every store sells an organic version. It’s sad, but you do what you can. Thanks for sharing this with us…we now have the rule of desserts are only on the weekends so we do not have them during the week anymore. Great job to your boys! And you for teaching them. My son recently told me he wanted to learn how to cook a dish from each country. I am working on putting together a curriculum for my kids to learn how to cook and make a dish from various countries. I plan to have it follow my daughter’s geography curriculum.